Applications that require both SCBA and fall protection are always challenging for the user. Putting a breathing apparatus on top of a fall protection harness is timeconsum ing when it comes to donning and uncomfortable in use. To combat this MSA has developed an innovative and unique 2-in-1 solution, the alphaFP SCBA harness. It can be connected easily to any MSA SCBA backplate. With the alphaFP donning is completed in very few and intuitive steps - thanks to its front opening system even within the confines of a vehicle. This saves time for the user - valuable time when it comes to rescue and saving lives. alphaFP offers the highest safety in exposed situations. Its excellent wearer comfort makes the alphaFP ideal for height and shaft rescues, respiratory protection and tunnel operations. The two versions alphaFP pro and alphaFP basic are available in standard and large size. 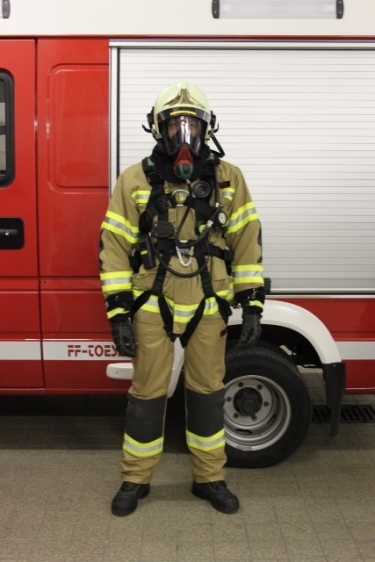 alphaFP pro additionally features hose protection tunnels on the shoulder pads and quick connect buckles between harness and SCBA for ease of mounting or emergency removal during operation. Positioning - D-rings on each side of the hip belt allow for safe positioning on an exposed work site. MSA is the first to offer fall protection harness for SCBA with combined approval EN 361, EN 358, EN 813 and EN 137. alphaFP can be combined with an emergency back pack. Certified with emergency back pack EUROPE B9000 by Fair Rescue International, Austria. MSA has been in the business of safety at height since 1930. Today it is at the forefront in both the supply and the range of innovative fall protection products. For further information on our extensive Fall Protection product line, please refer to leaflet 23-100.2.